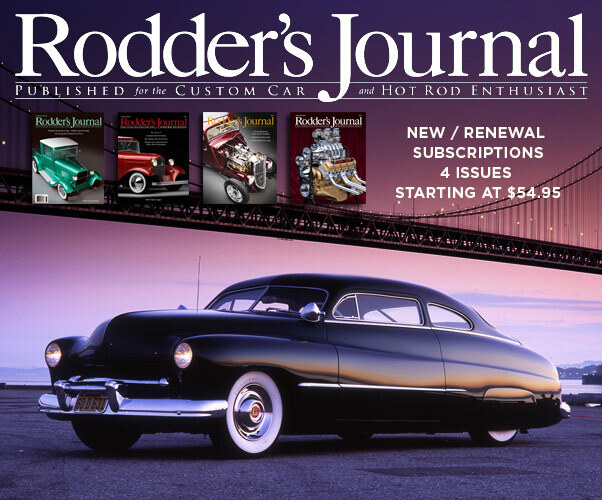 In 1941 Willis Horn from Marysville California purchased a Custom 1936 Ford Chopped Coupe from and Hot Rod Shop. Since 1973 it is owned by grandson Jeff Boone who is now looking to find out more on the cars history for a full restoration. 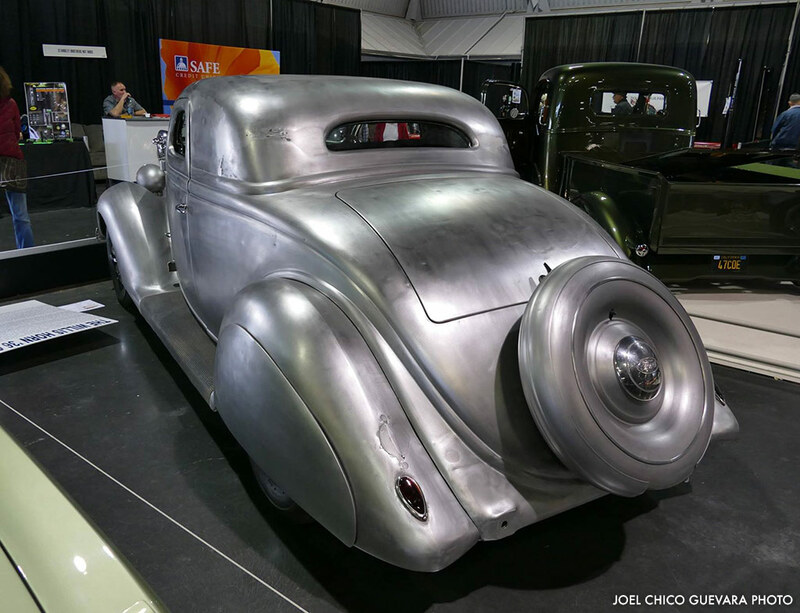 Jeff Boone from Live Oak, California, was given this early Custom Restyled 1936 Ford 5-window coupe as a gift from his grandfather back in 1973. Jeff was just 11 years old when his grandfather gave him the car. Information his grandfather might have told him about the cars history back then has been forgotten over the years. “Just a boy with hotrod dreams…”. 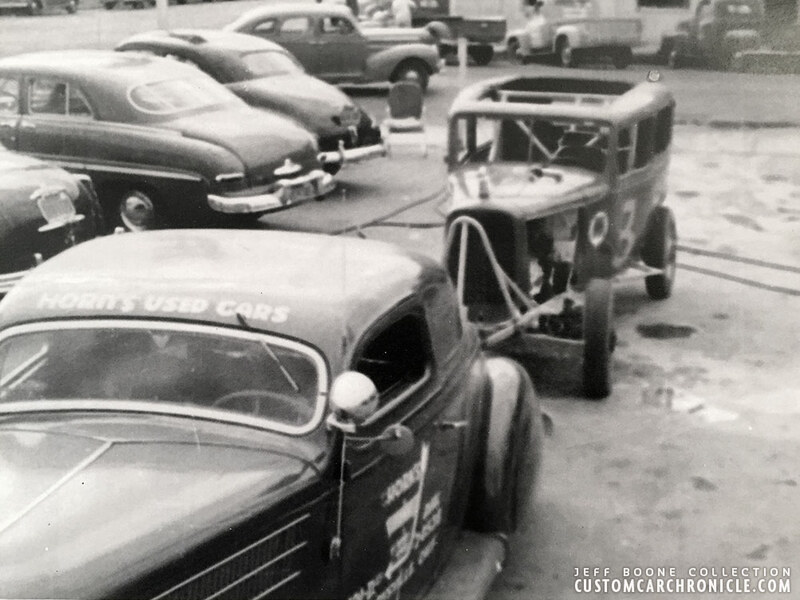 At 11-12 years old the fact of owning your own Hot Rod, and getting it ready to drive overshadowed the historical facts. During 1973 and 1974 Jeff and his grandfather worked on the car for a coupe of month before putting it away in a barn. In 2017 Jeff is ready to bring out the car and start putting it back together how it used to look. With the restoration work now started he is looking into the history of the car, finding old family photos and asking family members what they remember about the car. 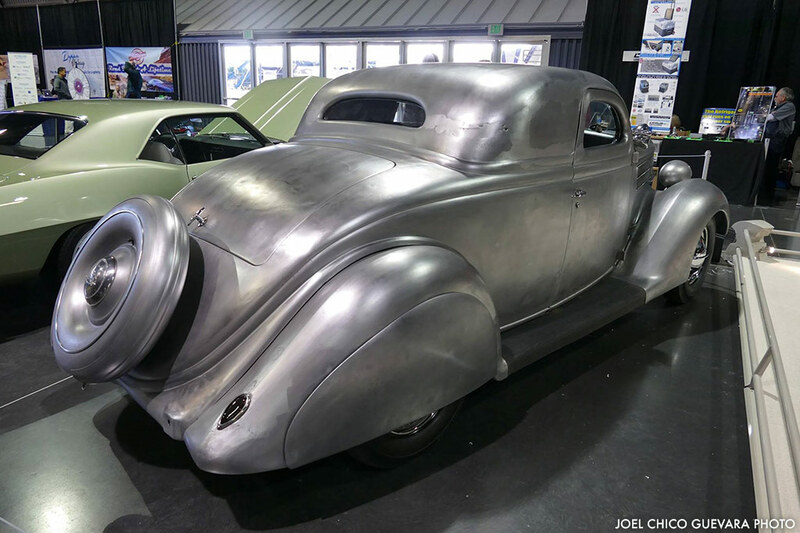 Not much is known about it, so Jeff is hoping that sharing the car here on the Custom Car Chronicle might shed some light on the history of this early Custom Car. We will be adding more material and info to this article when we find it. 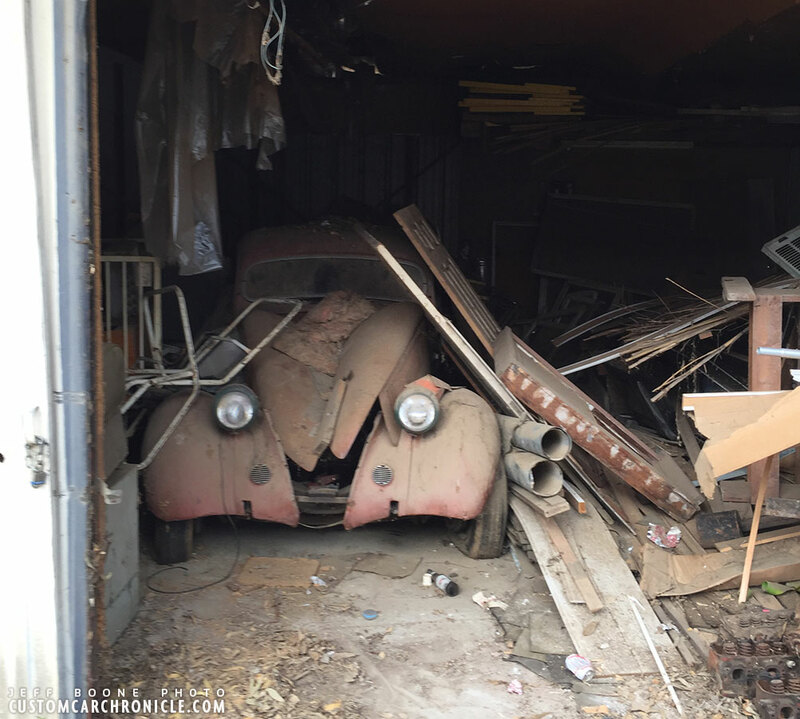 Including some photos of how the car looks now and it being pulled from the bar is has been stored in since 1974. 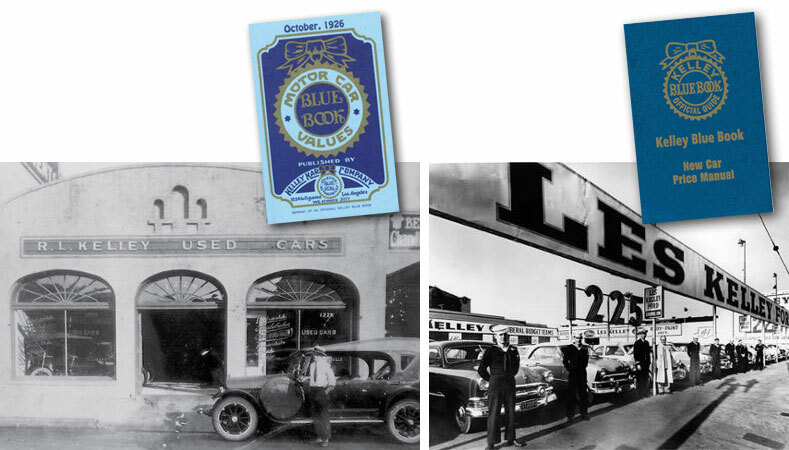 Jeff’s grandfather, Willis Horn from Marysville, California (close to Sacramento) purchased the ’36 Ford back in 1941. Jeff was told the car was bought from a Hot Rod Shop, but nobody seems to remember which one, or even where, if it was local, or from further away. 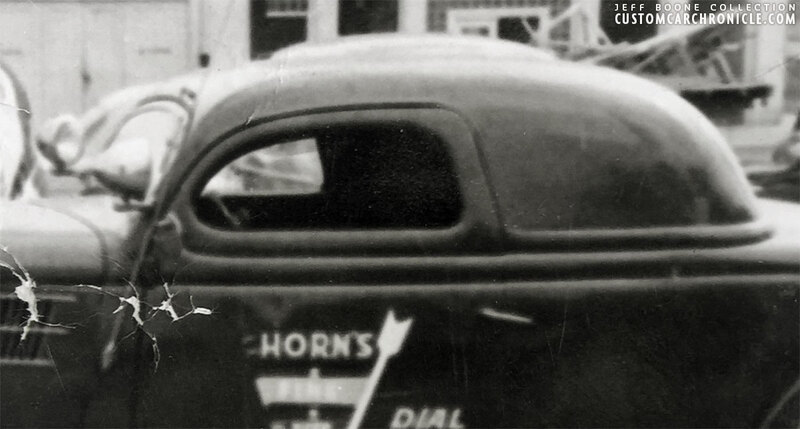 (Edit: we now know that the car was bought in Los Angeles in 1941, close to a place called Los Angeles Auto Auction, more about that further on in this article) At the time Willis bought the car it was completely finished as a Custom Car, with a unique chopped top with the rear quarter windows filled it, the b-pillars slanted forward, and the top door corners rounded. 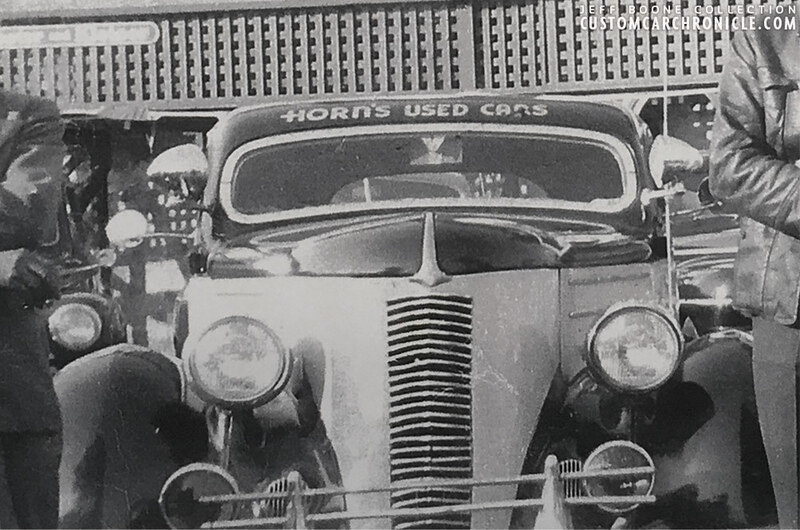 The car was painted green, and by the looks of the one black and white photo Jeff has found of this version of the car it was a dark shade of green. 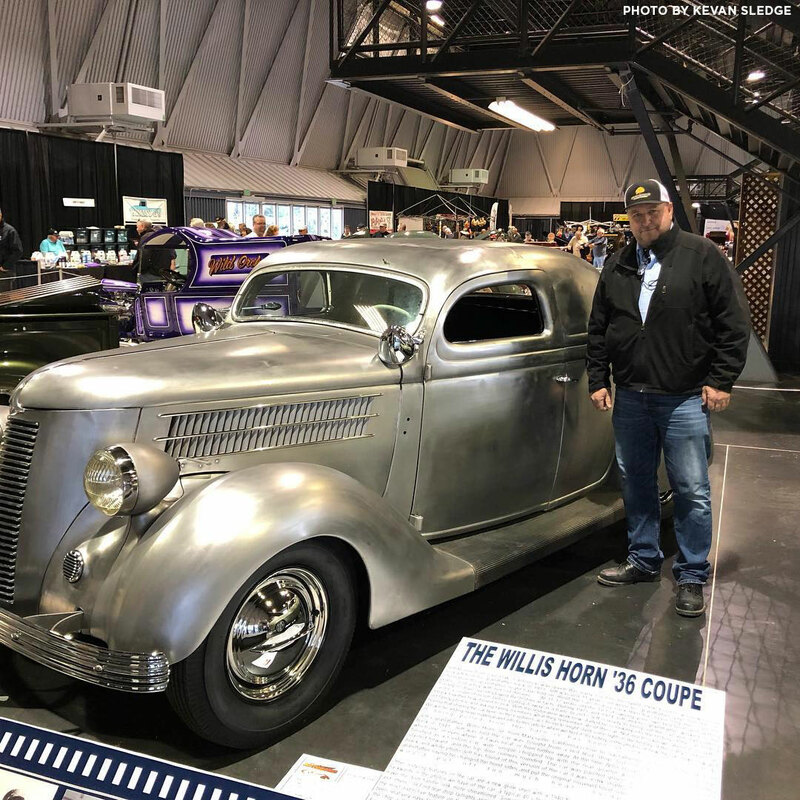 Jeff also recalls his grandfather saying he changed the hood sides and put the original louvered hood sides on the car cause the engine would put off too much heat inside the coupe… He never knew what type of sides were on the car when he first bought it? Stock ’36 Ford 5-window Coupe the Willis Horn coupe started out as. 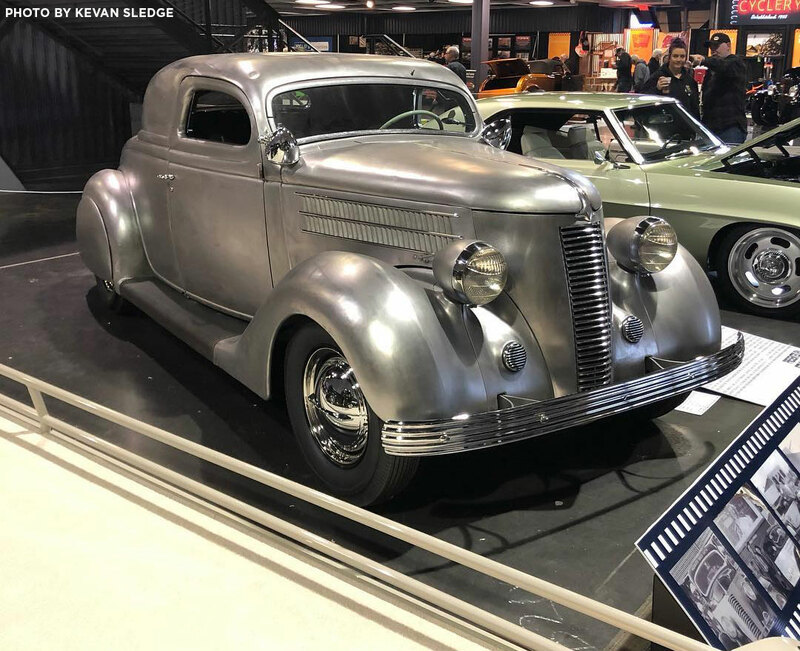 Other restyling features on the car are a new grille shell with a 1939 Nash grille installed, double Appleton spotlight facing backwards in the photos we have of the car, a typical 40’s feature. turned around door handles, also a typical 40’s trick to make the door handle look more streamlined. Something discussed in many of the early restyling manuals from Dan Post and others. ’39 Ford tear drop taillights and teardrop bubble skirts, and a chrome plated dash inside. The chop obviously being the most distinctive feature on this car. Very unique, especially for the time it was built, when 3-window coupes much have been relatively easy to find. 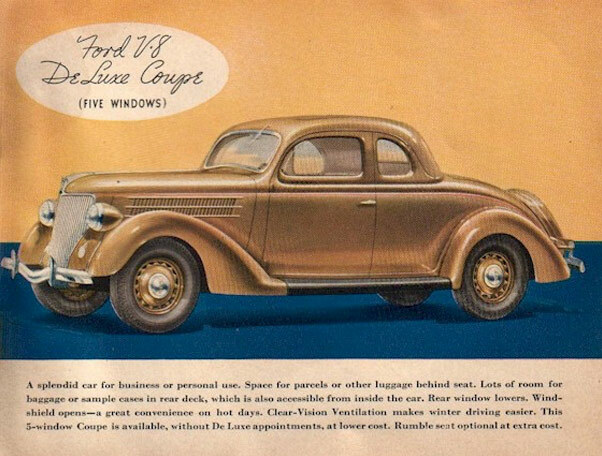 It was still decided to turn the 5-window coupe into a short door 3-window coupe. Unique about the chop is that the b-pillars are angled forward, and that the top door corners are rounded. 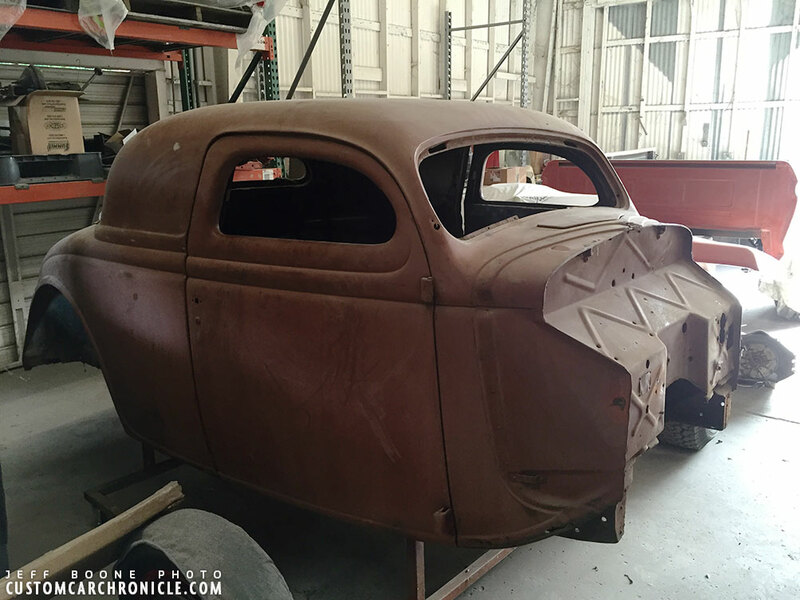 Rounded Door Corners on a ’36 Ford are rare, and having them done back in 1941 even rarer. Perhaps the earliest sample of rounded door corners I have come across so far. The belt line fabrication and filled top look to have been done very well, indicating the work was done by a good craftsman. 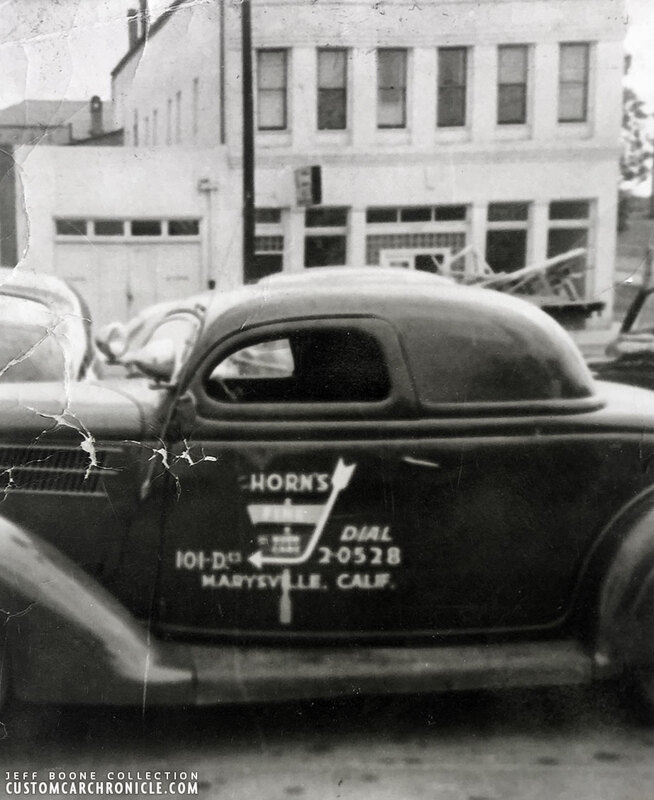 Willis owned a Used Car lot in Marysville, California, since the 1930’s. 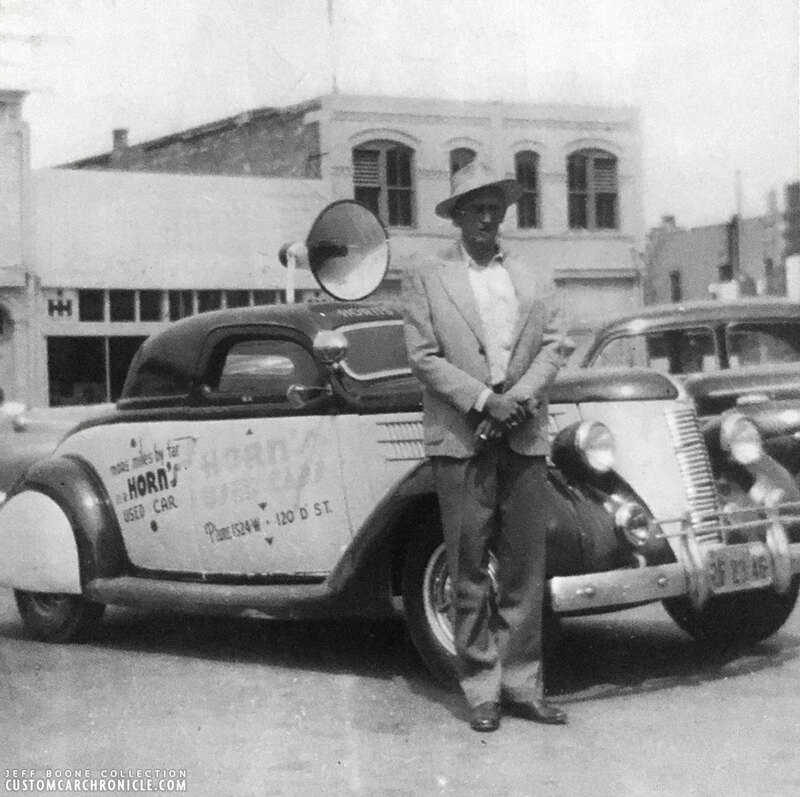 He used the ’36 Ford, which always attracted peoples attention because of its unique and good looks, as rolling advertising for his lot. Somewhere in the 1940’s Willis repainted the car in maroon with cream on the main body below the beltline. The car was also used as the lead vehicle in the annual the Bok Kai parade in Marysville. 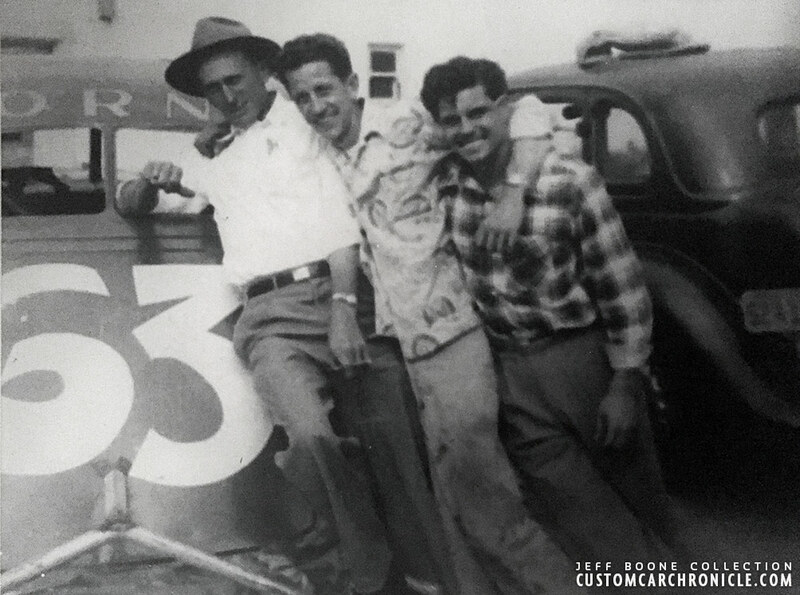 The 36 pulling Willis Horn’s race car… This must be around 1949, shortly before the car was repainted. Close up on the car from the previous photo. 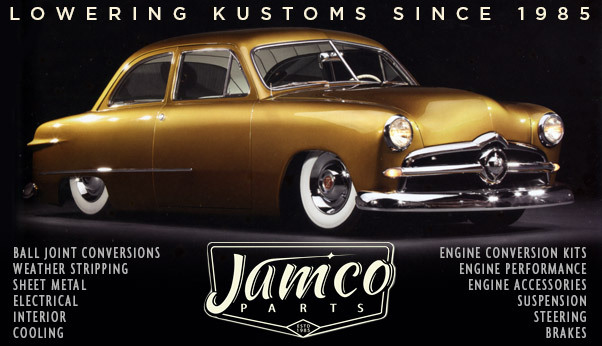 In the late 1940’s, the car was repainted in maroon with cream on the lower main body. 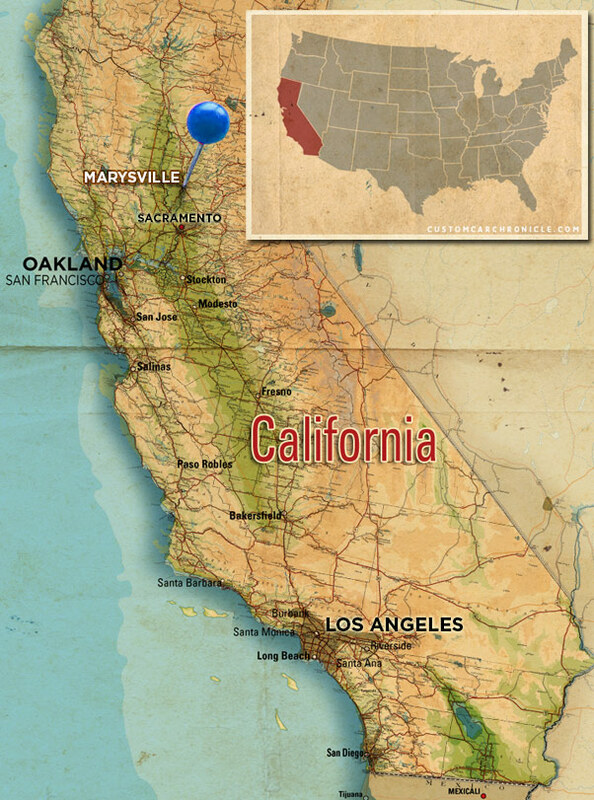 According to Jeff his grandfather Willis Horn alway led the Bok Kai parade in Marysville, California. And ideal opportunity to promote his used Car lot. So far this has been the best photo Jeff has been able to locate of the car. 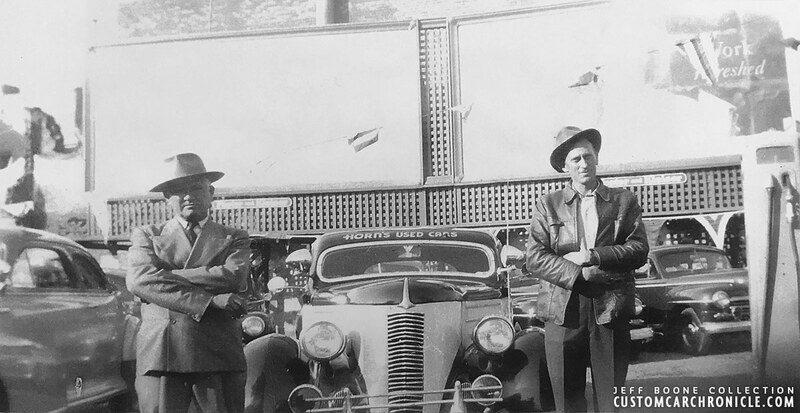 It shows the Nash grille, the single bar hubcaps, and teardrop skirts. Notice the loud speaker on top of the car. Judged on the license plate and tag in the photo this one must have been made between 1948 and 1950. 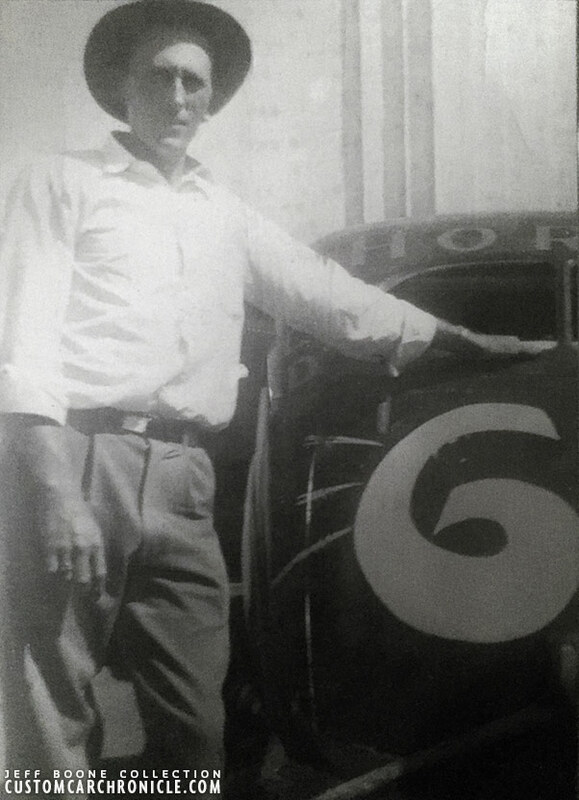 Willis posing with one of the three race cars he had. Willis (with hat) and a couple of his drivers. 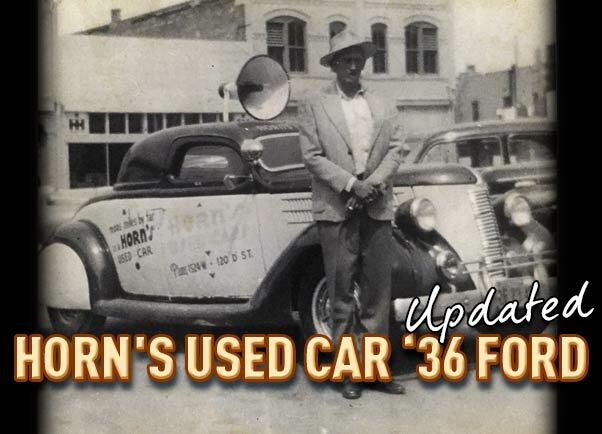 Jeff recently spoke with a good friend of his late grandfathers, Herman Jenkins about the ’36 Ford to see if more info could be found about the cars history. 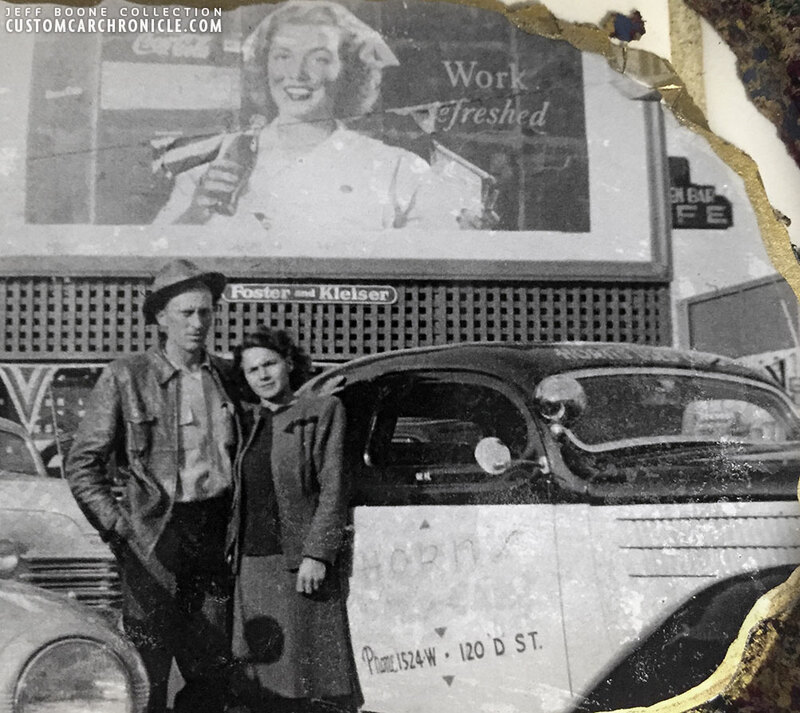 Herman remembered that his grandfather, Willis Horn, used to buy his used cars at the Los Angeles Auction Yard. 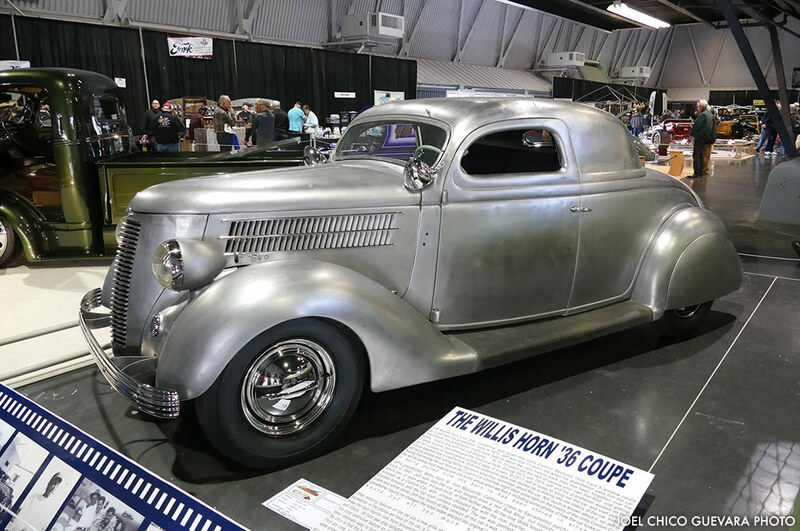 he could not remember where that place was located in Los Angeles, but he did remember that the Hot Rod Shop where Willis bought the ’36 Ford was very close to this L.A. Auto Auction. 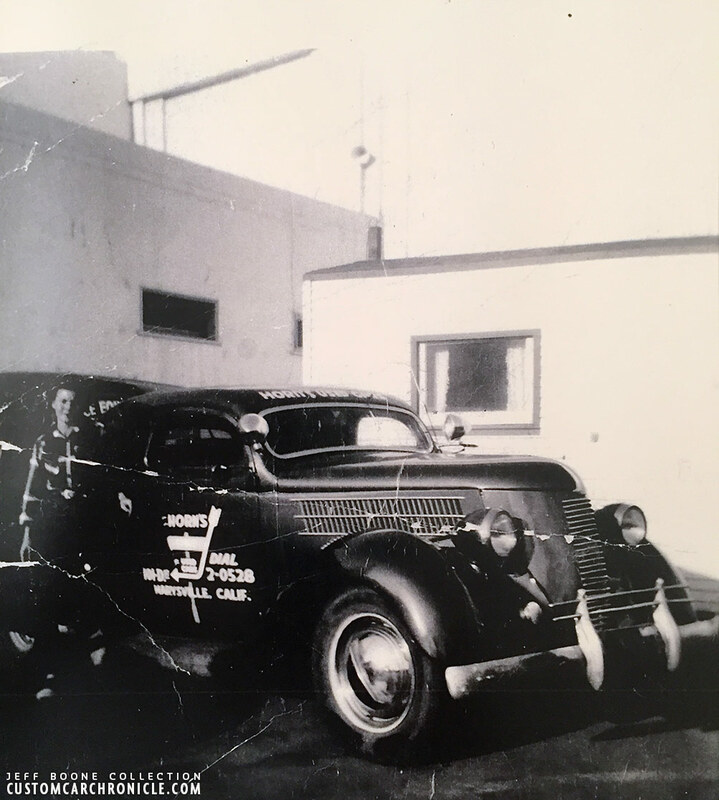 So, now we need to find somebody who might remember where this Auto Auction yard was in Los Angeles, perhaps that will help find the Hot Rod Shop who built this ’36 Ford. 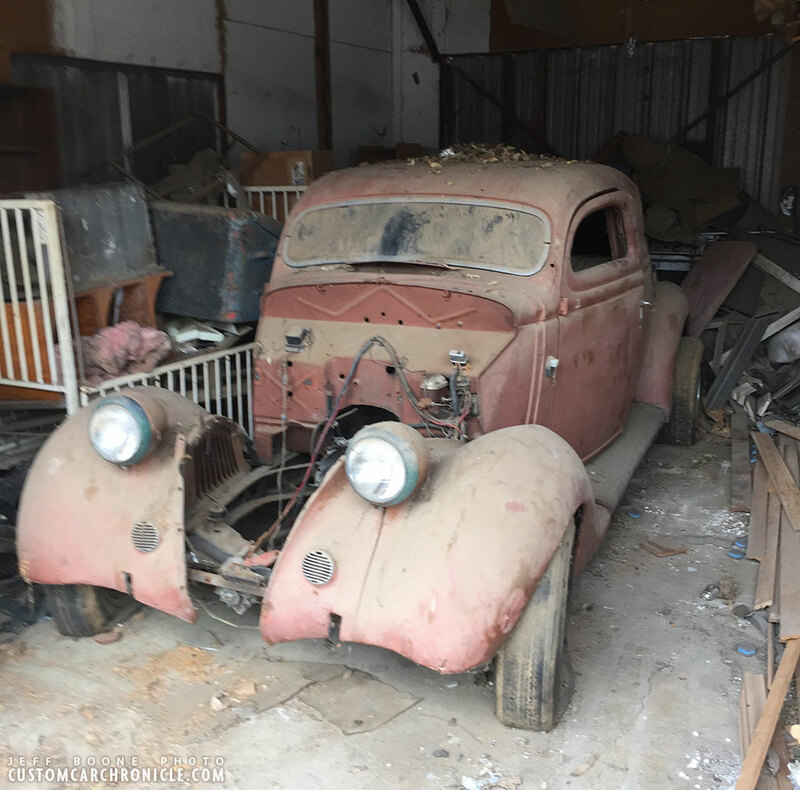 If any of our readers knows more about this Los Angeles Auction Yard, where it was located, please email Rik Hoving. Herman was in the US Navy stationed at Pearl Harbor during the Japanese attack and remained till 1947. When he was honorably discharged, he came home to Marysville and remembered that he and my Grandpa drove down to Los Angles and picked up the 1936 ford where my grandfather had a shop put a hotrod flathead motor and Three speed transmission which shifted on the column. He said my Grandfather told him the car was originally black, then green, then blue and lastly, it was maroon. He recalled the 36 had flat hood sides, but at some point, my Grandpa said it was too hot inside the car. He changed the sides to the original 36 ford hood sides so the engine heat could escape. (The road to Beale Air Force Base) Apparently it was the choice “drag strip” for my Grandfather! 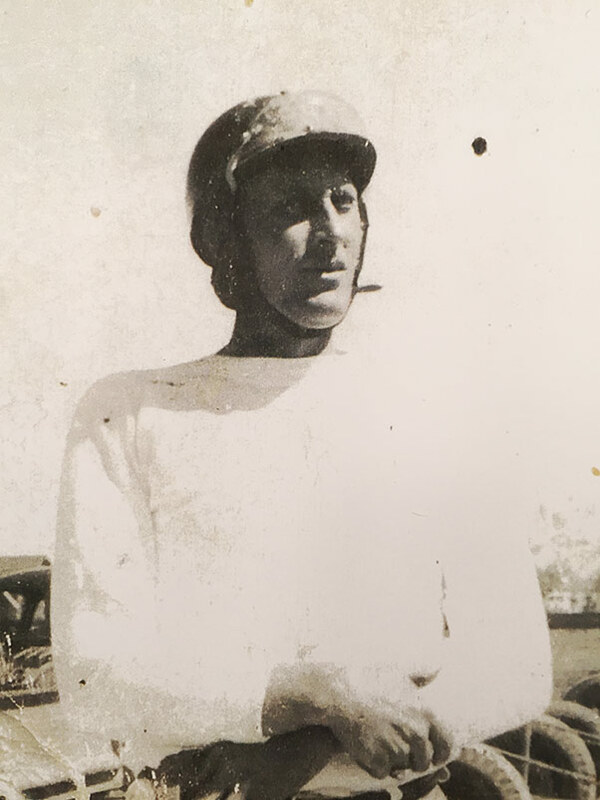 Herman remembered one story vividly… a guy who drove up from Los Angeles in his ’49 Ford 2-door, just to race my Grandfather! Herman said the LA guy says… I hear you have the fastest car in California! My Grandfather, a bit modest, said my car’s pretty fast and pointed at the 36 custom. The guy looked, started laughing,(customs aren’t supposed to be fast) and said he had $50 to race that car! Herman said your Grandpa says give me a minute, I’ll take that bet… Herman says “your Grandpa blew his doors off” (laughingly)!!! The guy was so upset he wanted a second chance, double or nothing. My grandfather told the Los Angeles guy he would even give him a head start…”when you leave, I’ll start”! Herman said…”I waved at the guy when we drove by”! Your grandfathers car was fast! When they pulled over, the LA guy handed my grandfather $100… Herman said they had a great laugh! Herman had shared so many great memories with my Grandfather, that I couldn’t remember them all! Unfortunately, On August 7, 2018 Herman Jenkins of Yuba City passed. Not only was Herman my Grandfathers good friend, but I would like to think he was my good friend as well. Herman also remembered that Willis bought new cars from a good friend in Los Angeles, Les Kelley. Les ran the famous Kelley Kar Company and Les Kelly Ford where Willis bought the cars wholesale and brought them to Marysville to resale at his own lot. Les Kelly Ford later moved to the corner of Figueroa and Pico in Los Angeles and becomes the largest used car dealership in the world. 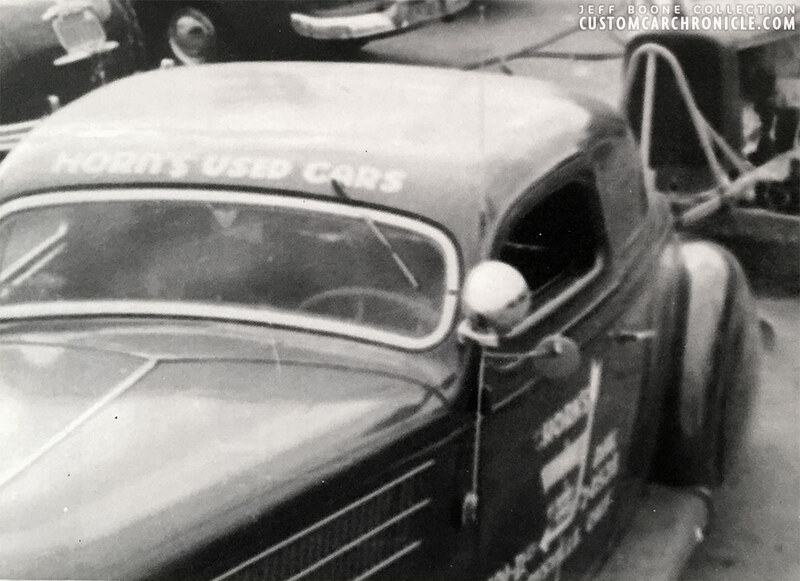 In 1975 Jeff’s uncle, Willis Horn JR, helped put a 327 Chev, a t350 trans and a 10 bolt rear end in the ’36. 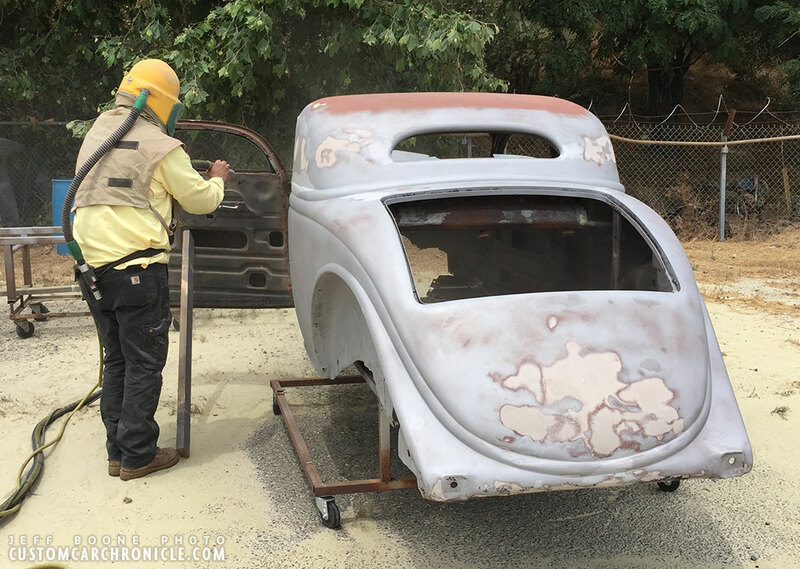 They did some body repairs with bondo in 1975 and the plan was to have the whole car painted 1936 Ford Maroon, but they got it in red oxide primer. At one point Jeff needed a new engine for his race car, so out when the 327. The the car with the fresh red oxide primer, went back to the barn till 5/25/2017. This is how the car has been sitting for many years. ﻿Clearing the rubble around it. 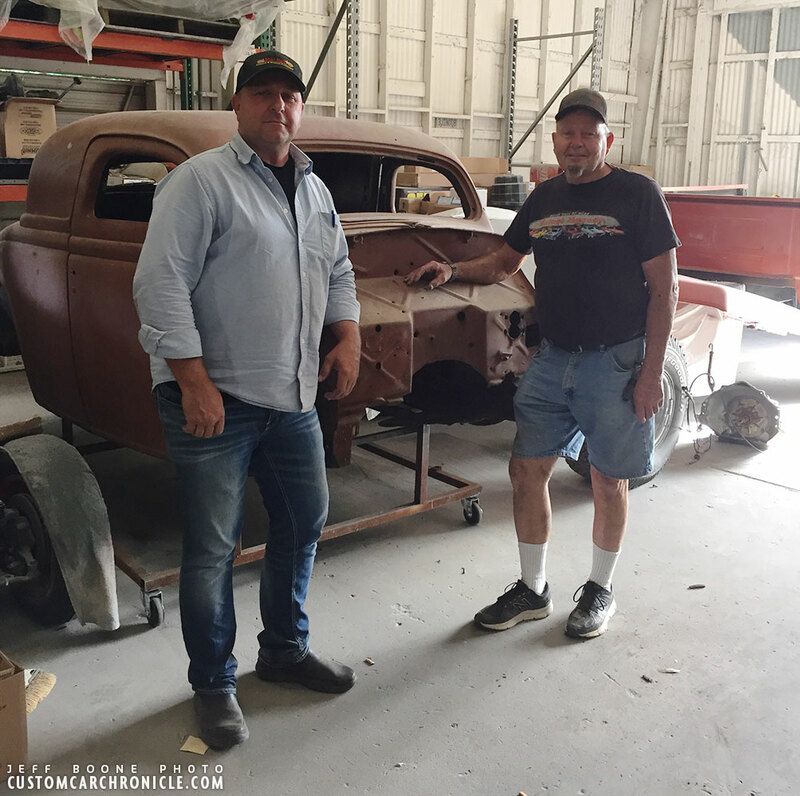 Jeff Boone on the left and his uncle, Willis Horn JR. on the right with the disassembled ’36 Ford. A good look at the main body with the unique chopped top turned from 5-window to 3-window back around 1940 in Los Angeles, California. The treatment of the belt-line behind the doors and the angled forward B-pillar and rounded door top is really unique. 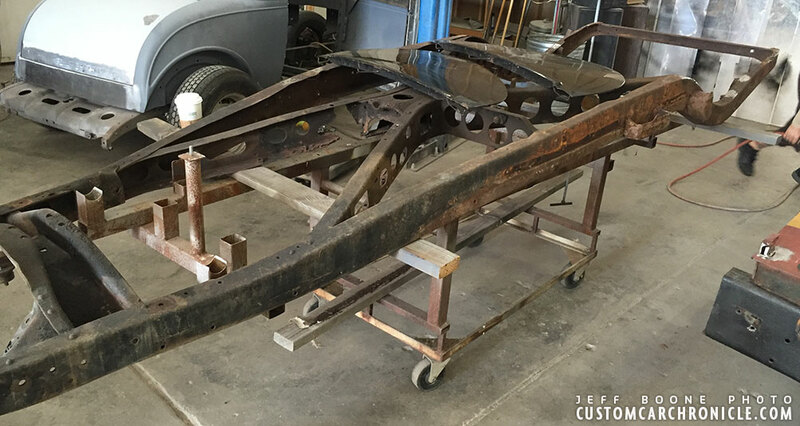 The bare frame of the ’36 Ford at the Standley Brothers Hotrod Shop. 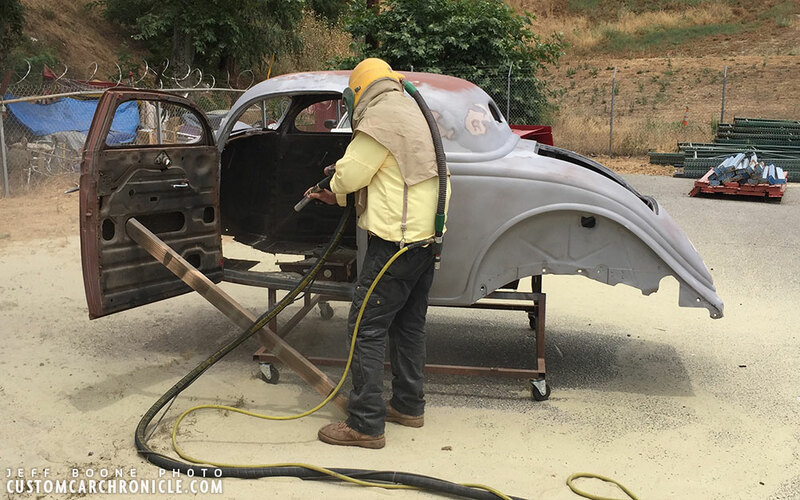 Soda blasting at Standley Brothers Hotrod Shop in Yuba City, California. The soda blasting revealed the body Jeff and his uncle added to the car back in 1975. Over the last couple of years Jeff has been working on and off on the restoration to how it used to look, and hopefully he will come across more photos from the 1940’s how the car looked. Hopefully with the help of the Custom Car Chronicle readers he will be able to find out more on the cars original history from before his grandfather bought the car in 1941. 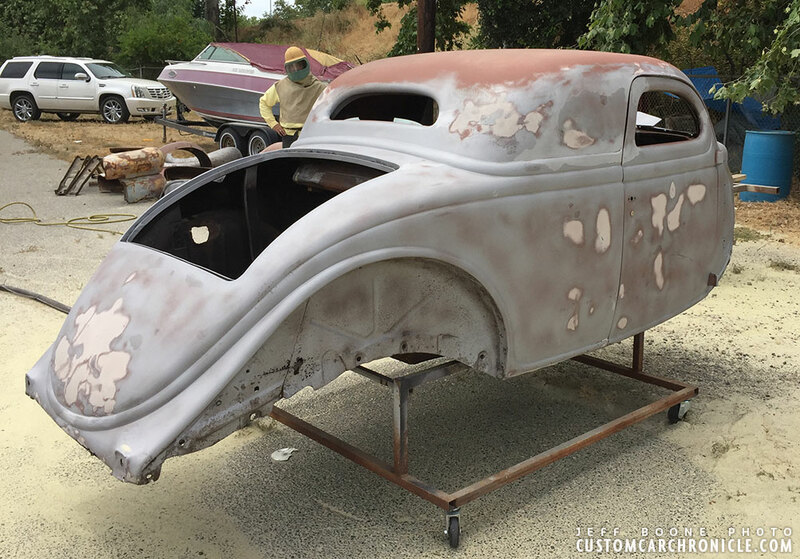 If you know anything more about this ’36 Ford Custom ex-5-window Coupe, from pre 1973, then please email Rik here at the Custom Car Chronicle. We would love to add any new historic info to the article and help Jeff with the history of his car. 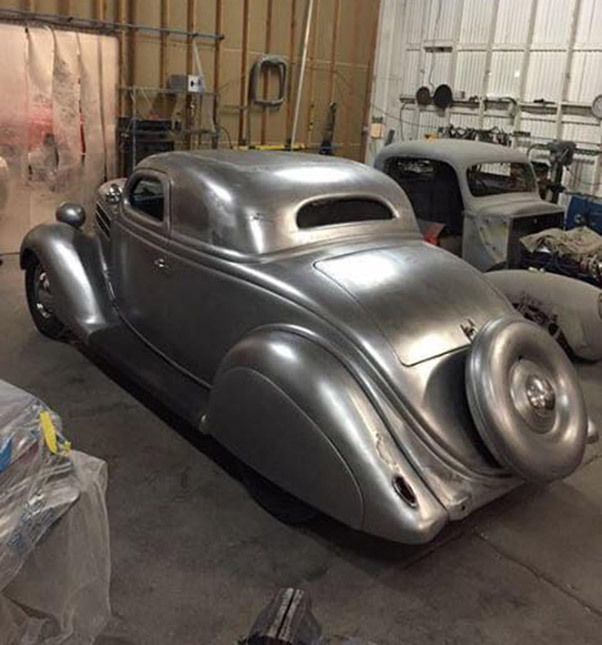 The car in bare metal ready for the Sacramento Autorama 2019. Jeff Boone with the Ford at the 2019 Sacramento Autorama. The distinctive Nash grill and very near Sacramento location would perhaps point to a Westergard connection, surely? My thoughts as well Quentin. That plus the quality of the work done. Given the time period how many others were out there doing that type of work? Too bad George Barris is gone. He might have known something about this car. Ah yes. Another custom mystery……. Very interesting. Can’t say I’m a fan of the filled window and B-pillar treatment, but it certainly is a unique look. Does he plan to restore it to the green or the maroon/cream version? Wow, great to see this one coming back to life! I like the unique shape of the early chopped top…being done in LA, it could have been Jimmy Summers…but it doesn’t really mimic his restyling fashion. The work on the B pillar is very interesting! Can’t wait to see more. 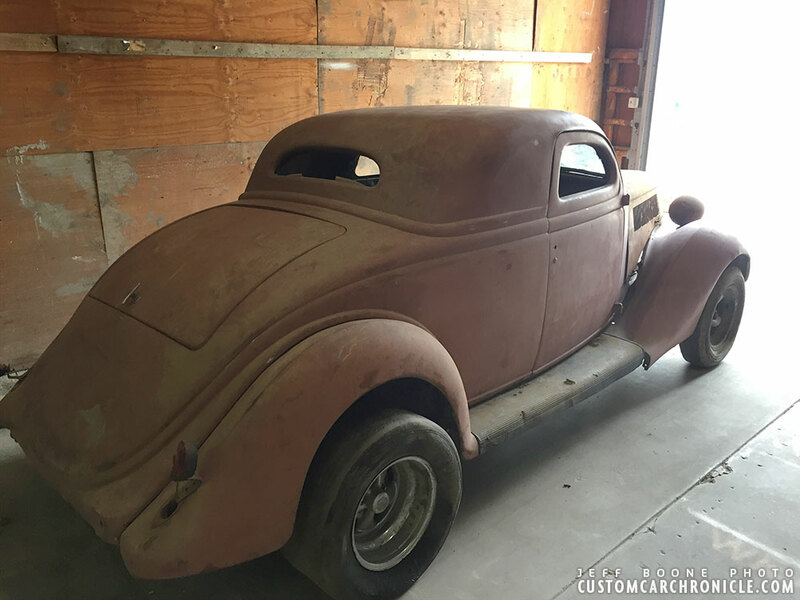 Perhaps sticking with a ’36 Ford lightfast maroon, skirts, Firestones, early 112s, and some overstuffed wide rolls and pleats would make this one fantastic early kustom with real history!